In a skillet, heat olive oil over medium heat. Add onions, mushrooms, and cubanelle pepper and cook until they are softened, about 5 to 7 minutes. Add sausage and cook until sausage is cooked through ( if using precooked sausage, then just cook until heated through). Stir in cherry tomatoes, dried oregano, and ½ cup of marinara sauce and cook for about 2 to 3 minutes. Season with salt and pepper to taste. Remove from heat and prepare squashes. Cut squash in half, lengthwise, and scoop out seeds leaving about inch border around the edges. Pour remaining amount of marinara sauce ( about 1 cup) into the bottom of a 9 x 13 inch pan. 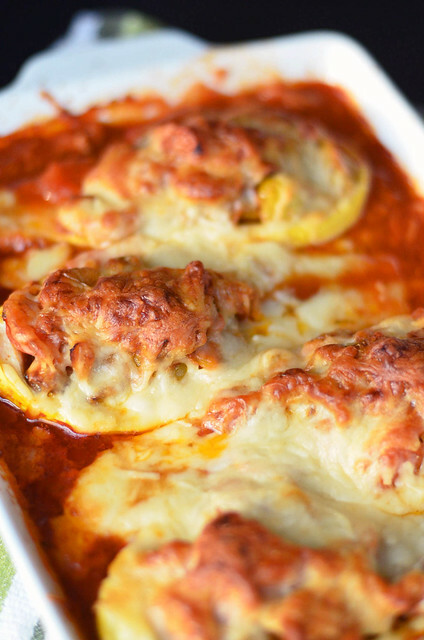 Place squash halves in pan and generously fill each squash half with prepared filling. Top with shredded cheese and place in preheated oven for 30 to 40 minutes until cheese is bubbly and squash is fork tender. Remove from oven and let cool for about 5 minutes before serving.